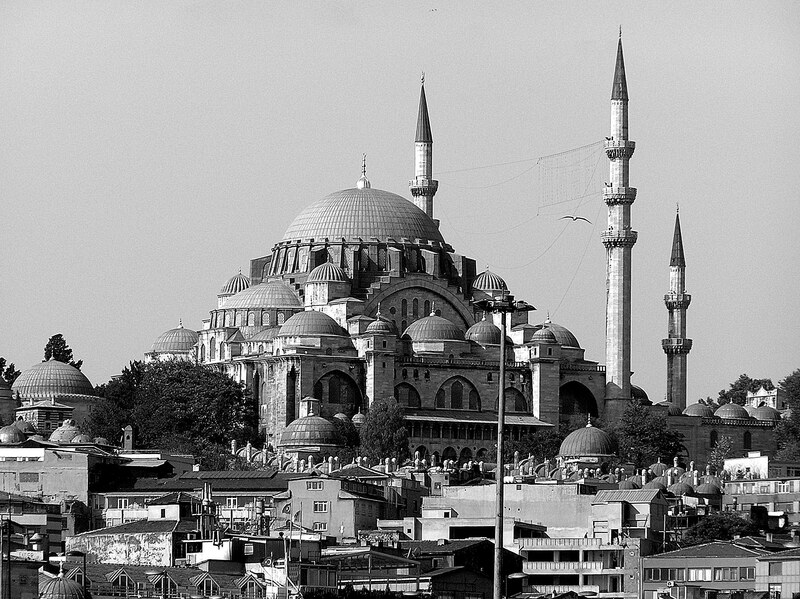 My first trip to Istanbul was with my dad in September 2005. We arrived during Ramadan and spent our first evening wandering around the food stalls that lined Sultanahmet Square and the Hippodrome. The local residents had started queuing well before sundown in order to be first to enjoy the array of delights: stuffed aubergines, lamb kebabs and baklava…as well as the more touristy fare of popcorn, turkish delight and toffee apples. There were fairy lights, crafts stalls, live music and a really friendly, festive atmosphere. The obelisk in the Hippodrome was dramatically illuminated and both Aya Sofya and Sultan Ahmed Mosque, situated at either end of the square, were covered in lights and set off in all their splendour. I decided immediately that I loved the city. 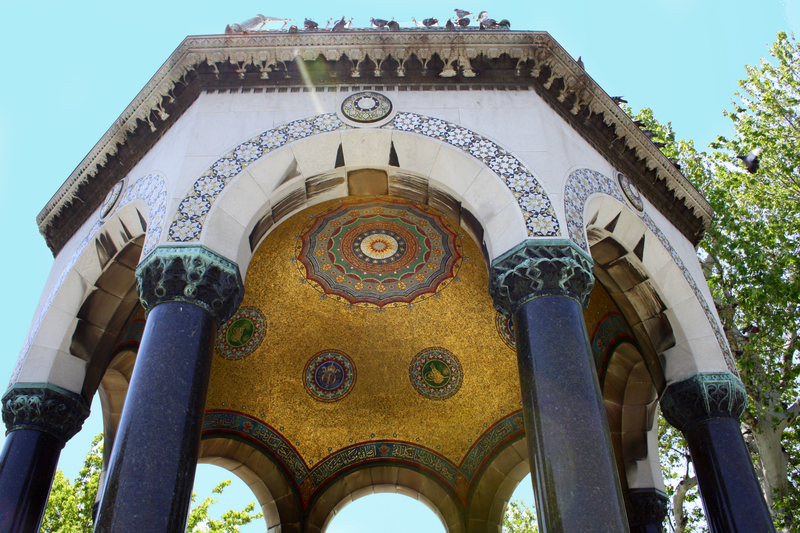 There are too many wonderful sights in Istanbul to list them all, but I’ll mention just a few. 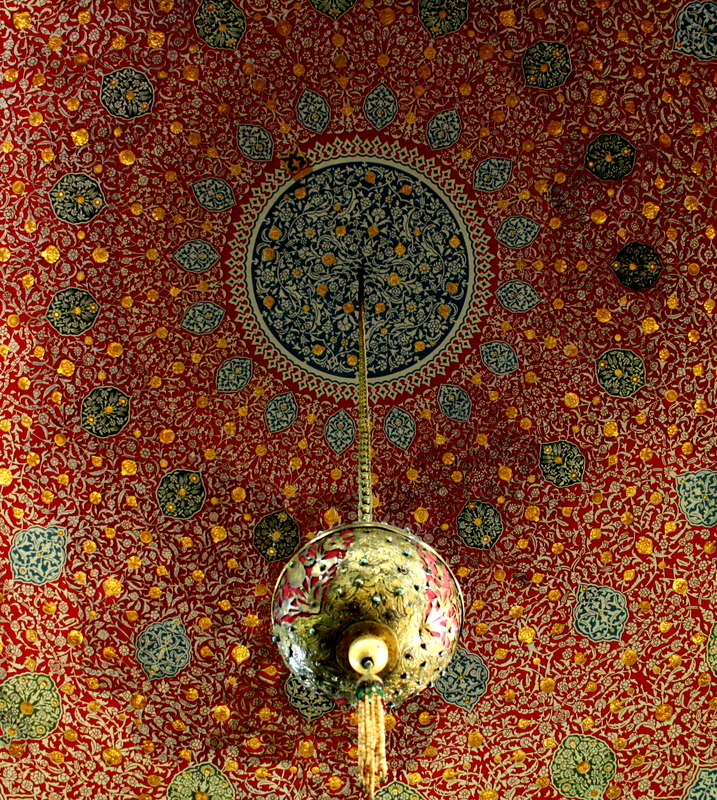 First, Topkapı Palace. Built in the 15th century, the palace was the royal residence of the Ottoman Sultans for 400 years. Converted into a museum in the early 20th century, it now contains various holy relics of the Muslim world, Islamic calligraphic manuscripts and murals, and a host of Ottoman treasures and jewellery. Passing though the Imperial Gate and the Court of the Janissaries, you reach the impressive Gate of Salutation that leads you into the palace itself. The complex is vast, with hundreds of rooms, grassed courtyards and fountains. Aside from the Treasury, with its stunning array of sceptres, jewel-encrusted daggers, and random piles of ‘spare’ giant rubies and emeralds, the Imperial Harem was the highlight. Home to the Sultan’s mother, his concubines, eunuchs, wives, children and servants, the labyrinth of passageways, secret doors and terraced rooms is a gateway to a completely unfamiliar time and culture. The Imperial Sofa (throne room) and crown prince’s apartment – where he was kept in isolation in a gilded cage – are opulent and colourful, yet have a real sense of foreboding. 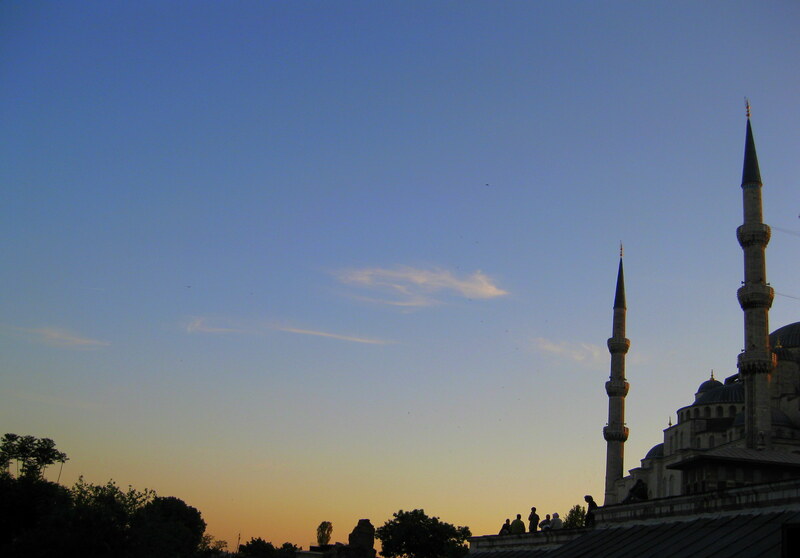 The feeling soon dissipates, however, as you exit to the İftar Pavilion with its beautiful view over the Golden Horn. With the sun beating down, I could have happily stayed there for the rest of the day. But then I’d have missed seeing what has become my favourite building in the world: Aya Sofya. The original building was constructed in only five years, opening in 537 under the Roman Emperor Justinianos. 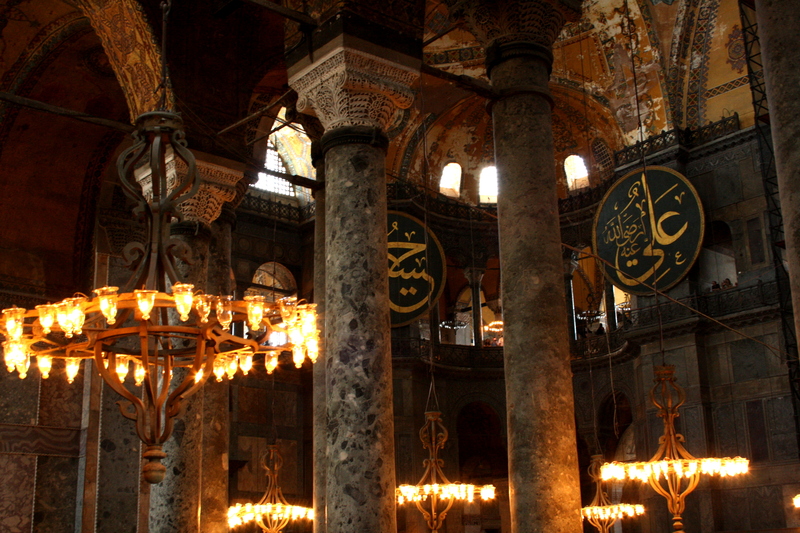 It was used as a church for 916 years (being the world’s largest cathedral for most of that time) and then, following the conquest of Istanbul by Fatih Sultan Mehmed, the building was converted into a mosque. It was used as a mosque for almost 500 years and then in 1935 under the order of Atatürk (the first President of the Republic of Turkey) it was converted into a museum. I can’t describe how amazing this building is. Standing in the centre, looking up at the domed basilica, takes your breath away. Golded mosaics and gigantic boards of calligraphy adorn the interior, and the exterior – with its four tall minarets and salmon walls –is equally impressive. I must have taken about 100 photos! 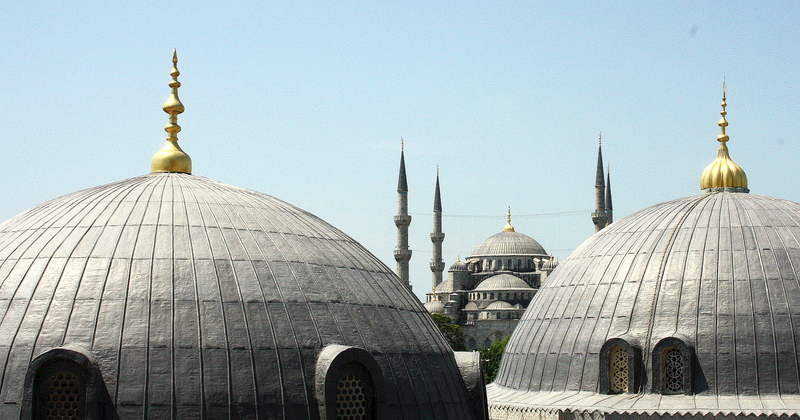 Whilst nothing could top it, Istanbul is not short of other fantastic architecture. Both Sultan Ahmed Mosque (better known as the Blue Mosque) and Süleymaniye Mosque are remarkable and still working places of worship. With your shoes off and head covered (if you’re a lady), it’s easy to see why the buildings evoke such a sense of wonder and majesty in their congregation. On my second visit with Paul and his family in 2009, we sat for some time on the Blue Mosque’s courtyard steps just as dusk was approaching, admiring how the stunning golden light lit the nine domes. 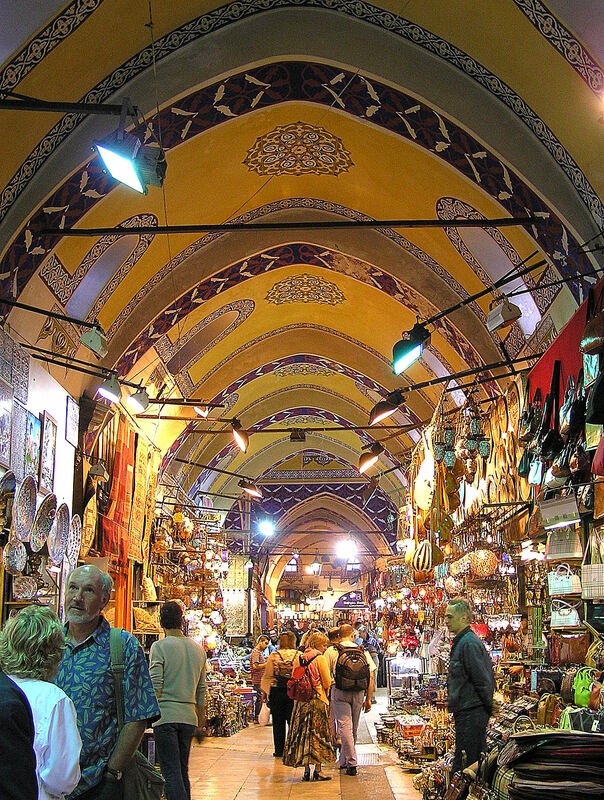 The Grand Bazaar is also spectacular. One of the largest and oldest covered markets in the world, with 60+ covered streets and over 3,000 shops: it is very easy to get lost! My first proper experience of haggling (if you don’t count the time in Tunisia when my dad tried to swap me for camels) was semi-successful – I definitely talked the shop-owner down, but don’t really think I came away with a bargain. Still, the glass lamp is in our bedroom to this day and looks lovely. Just two more buildings I have to mention… the Church of St. Saviour in Chora, which my dad and I sought out, and Dolmabahçe Palace on the Bosphorus strait, which we visited on my second trip. Now a museum, St. Saviour’s is considered to be one of the most beautiful surviving examples of a Byzantine church and is covered in exquisite mosaics. It was well worth the taxi trip, though the walk back took us through one of the poorest neighbourhoods and it was difficult to witness barefoot children searching for metal scraps to sell. A reminder that outside the tourist centre Istanbul unfortunately still has areas of real poverty. The glamorous Dolmabahçe was built in the 19th century as the administrative centre of the late Ottoman Empire and has the world’s largest crystal chandelier. I’d seen it from a boat on our first trip and so was glad to have the opportunity to go inside. Patrolled by the palace guard and accessible only via guided tour, it is a strikingly lavish building reminiscent of Versailles in France. 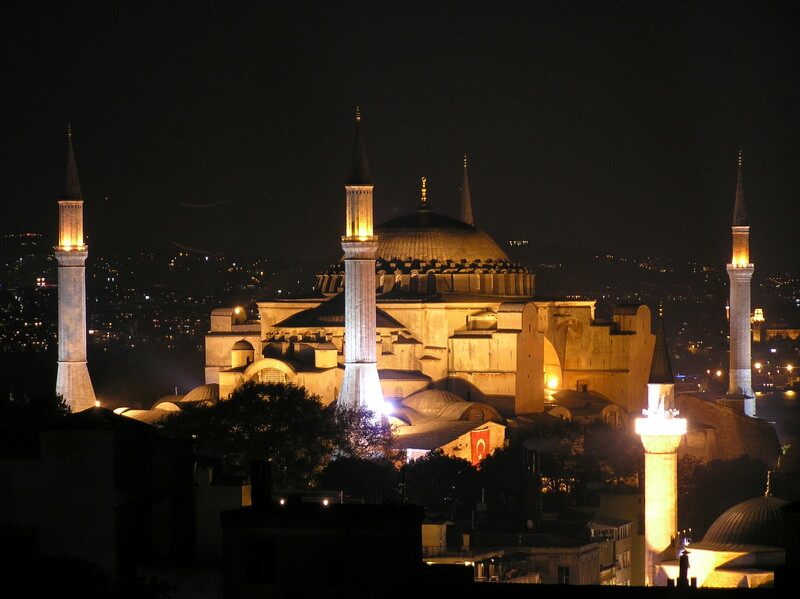 This entry was posted in Travel and tagged Aya Sofya, Bosphorus, Istanbul, Mosque, Spice on March 22, 2013 by victoriassecretblog. Topkapi (1964) heist caper starring, among others, the wonderful Peter Ustinov who is part of a gang who conspire to steal a jewel encrusted dagger from the eponymous palace. 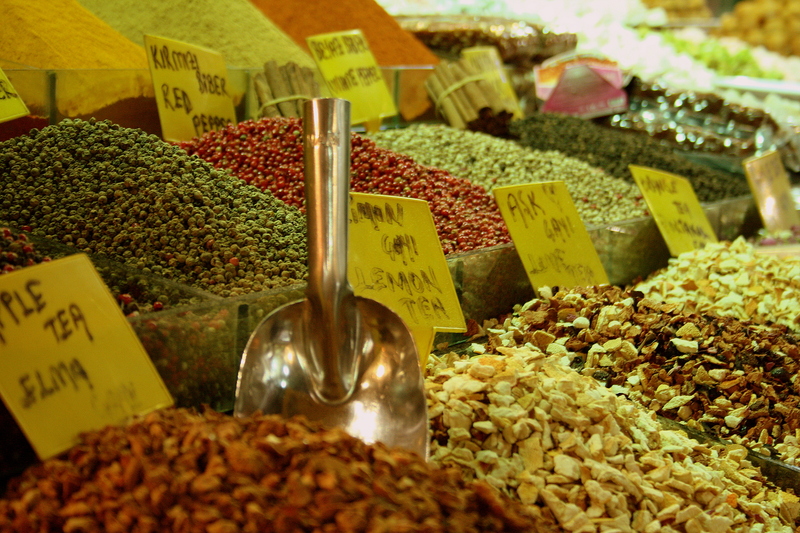 Never been to Turkey but love the film..
Great blog Vicky! Brings memories back for me of a great holiday there a few years ago. Stunning city and the fish sandwiches served from the boats are delicious!